Our main objective has always been to achieve the highest levels of quality. We continuously check incoming materials using specific equipment (callipers) for dimensional checks and laboratory tests. The raw materials we receive are certified both as regards their characteristics and quality. During the production process, each operator carries out a visual and dimensional inspection of the work being carried out. We make regular statistical checks in line with the rules established by relevant legislation, particularly as regards seals under pressure, unthreading of fittings, bursting of hoses and the simulation of water hammering using specific equipment. In addition, several times a year, the certifying bodies send inspectors without any advance notice to check production and take samples of products to test them. 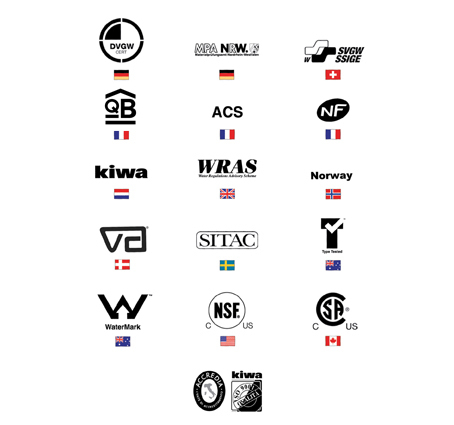 The homologation certifications that we have obtained for both angle valves and for flexible connecting hoses endorse the above.